ARMY AIR CORPS SETS UP ELABORATE DEFENSE SYSTEM AMERICA’S most elaborate air-defense information center has just been completed in New York City. It is the best equipped in the world. Minute-by-minute reports from more than 6,000 field observers will enable Air Corps experts, working” at tables that resemble pieces from a giant jig-saw puzzle, to plot the progress of enemy bombers and to direct the swift climb and attack of interceptor planes. 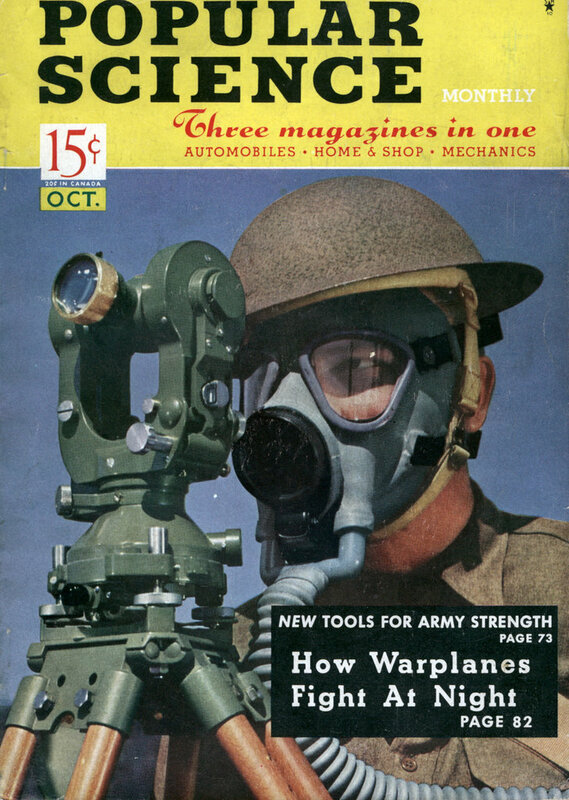 Even before the bombers reach the coast, the Army’s latest locator system will spot their position and, as soon as they wing inland, observers at five-mile intervals will flash in their reportsâ€”giving the type, number, height, and direction of the invading planes. As each flash reaches the New York nerve center, a marker, known as a “plotter’s pip,” will be placed on one of the jigsaw tables at a point that coincides with the position of the reporting observer. The table is called the “filter board” because here mistaken reports are filtered out. The men who place the markers on the board are designated “plotters.” Behind the plotters stand the “evaluators.” As soon as these trained Air Corps men decide the course the invaders are taking, they replace the pips with arrowsâ€”colored red, blue, or yellow, according to the time of the hour the reports are received. Instantly, “tellers,” sitting in a balcony overlooking the board, speak into telephones and similar arrows appear on a similar board in an adjoining room. This is the “operations board” from which final decisions are made. There follows a swift succession of events. In a soundproof balcony overlooking the board, the controller, flanked by a pursuit officer and a radio control officer, assigns the invading “target” to one or more pursuit squadrons. In a matter of seconds, the complicated machinery of aerial defense is in full motion. Even before the interceptor planes begin skyrocketing up from the air field, pursuit officers in one of the six interceptor offices at the center are plotting the best course for engaging the enemy. These officers, in constant radio contact with the fighting planes, direct the whole attack from the ground. When plotting their navigation charts, they use colored pencils, changing every five minutes to coincide with changes in the color of the arrows on the operations board. 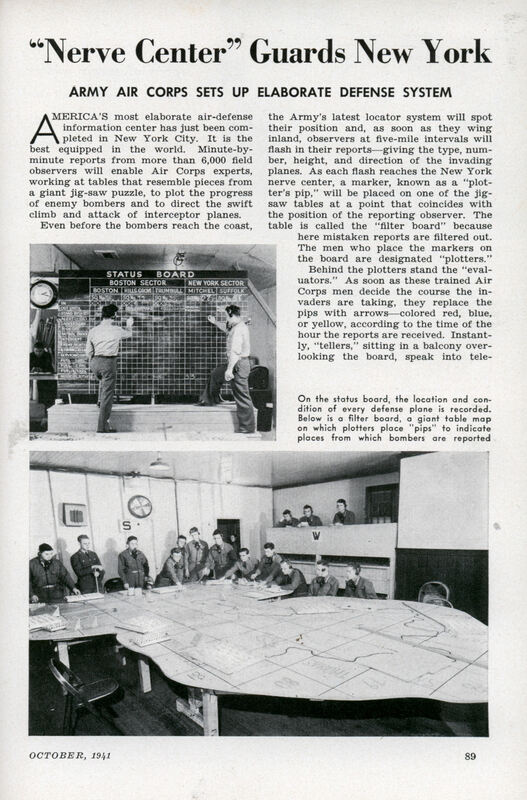 While this activity is going on, the civil air-raid warden is flashing out warnings to communities in the path of the attack; members of the intelligence division are noting down details of the raid for later study; officers of the First Interceptor Command, watching a third board in another room, are keeping track of developments and coordinating activity throughout an area that extends from Maine to below Cape Hatteras and from the Atlantic Coast as far west as Minnesota. This vast area will be safeguarded by 13 information centers, each in a major city. Every center will have an auxiliary station ready to take over in less than eight minutes if the main center is destroyed or disabled. In New York, for example, is located the auxiliary filter board for Scranton, Pa. In all parts of the country, air defense nerve centers, similar to the one in New York City, are under construction. In the near future, between 30 and 40 will stand guard, fully equipped for emergencies. But were they able to defend against the onslaught of Enemy Walking Sponges! A good percentage of the staff appear to be women. A good percentage of the staff used in similar facilities in England (which actually were put to use, of course) during WW II were women. My question is, from what airfield would enemy bombers attack New York in 1941? At the time, German bombers were hard-pressed to make it from France to London and back. Was someone expecting Greenland to join up with the Axis powers? Germany’s navy was negligible, so a carrier attack in the Atlantic wasn’t in the offing. Looks to me like there’s an allocation of resources issue here. Maybe they should have put more of the air-intercept assets farther west, like maybe in Hawaii . . . Correction, the German navy was negligible except for the U-boats — but U-boats posed no threat of aerial bombardment (despite what you might read in some articles at this site).